As kid, Carls Hot Dogs (actually the name is Carl’s Red Hots but we call it Carl’s Hot Dogs), located at 83rd and Jeffrey, was one of Phil Graff’s and Steven Pinkert’s favorite haunts. 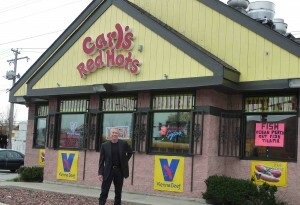 We loved Chicago style Vienna hot dogs and still do to this day. As kids we used to imitate Carl making the dogs and we even had a jingle that we created that we sang as we played and pretended that we were making hot dogs. We had bowls of water instead of real condiments that we would pretend to ladle onto each hot dog we lovingly prepared. 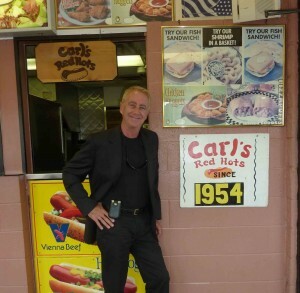 Over the years, I have tried many hot dog joints but I fondly remembered Carls. As a kid Carl’s Hot Dogs were only 25 cents so we could always afford it. I worked at Nolans Radio Repair shop which was just 2 blocks or so from Carls on 83rd Street and so I would frequently run to Carls for lunch. Monday I left Miami for Beijing and had a long layover in Chicago. So Phil picked me up at O’Hare airport and we headed down to Carls. This was about an hour drive from the airport as traffic wasn’t too bad – and Phil took the scenic route along Lake Shore Drive which was fine with me. 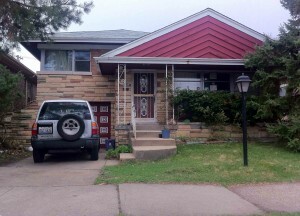 We drove by my old house on Yates where I lived until age 15. It looked much smaller than I remembered.and this observations was confirmed by my sisters as I emailed them a photo of the old house on the fly. 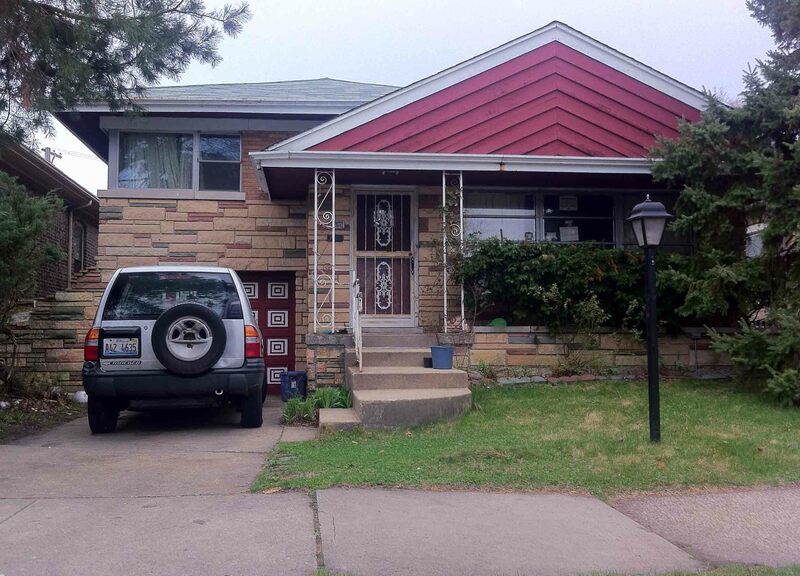 We continued on our tour past Phil’s old home which has been beautifully preserved and brought back so many memories. The area where we dug tunnels and mined “coral” is now just a parking lot. Sad, as kids we had so much fun playing in the undeveloped patches of land on our neighborhood. Now everywhere you look you see either a structure or pavement. Phill and I went inside and ordered 2 hotdogs each with fries and diet cokes. The tab came to about $15 which seemed fair – if they were good. Carls by the way has been in business since 1954! It is incredible that they have survived all these years given the short half life of most restaurants. So how were the dogs? The hot dogs were just like Steven Pinkert and Phil Graff remembered them. Perfect spicy Vienna beef dogs with all the trimmings, and the fries were crispy – different from the greasy fries they served when we were kids. The hot dogs snapped just a drop when you bit into them – almost perfect! The only disappointment was that the buns lacked poppy seeds which is critical in my opinion for a perfect Chicago Style hot dog. 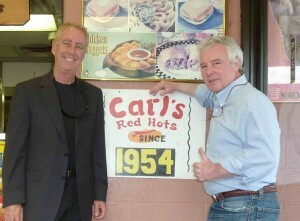 Here is a nice shot of Steven Pinkert and Phil Graff inside Carls. Note my expression of excitement and anticipation as we waited for them to make our dogs. This entry was posted in Family and Food and tagged Carls Hot Dogs, Steven D Pinkert, Steven Pinkert by Steven Pinkert. Bookmark the permalink. I do not even know the way I ended up listed here, but I thought this article was fantastic. I do not know who that you are but without doubt you?¯re gonna a prominent blogger if you happen to aren?¯t already Cheers! I found your weblog by way of blog catalog. I believed I’d verify out the article as I just wrote on this issue currently. You include some wonderful tips that I failed to have. Thanks to the tips.